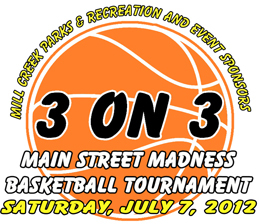 The City of Mill Creek Parks & Recreation is hosting the annual 3 on 3 “Main Street Madness” Basketball Tournament on Saturday, July 7. All registered participants will receive a free pizza from Papa Murphy's Pizza. Registrations submitted by Friday, June 15 will receive event T-shirts. Final registration deadline is Friday, June 29. Fees are $110 for Adults and $90 for Youth. The tournament will be held in the City Hall Annex building parking lot 15720 Main Street Mill Creek, WA 98012. The City of Mill Creek is seeking volunteers to help with the tournament. Click on this link for volunteer information. For more information, please visit www.cityofmillcreek.com or contact the Parks & Recreation office at (425) 745-1891.